After playing a very enjoyable and fun game on my Android phone, another equally entertaining game lands on my Google Nexus One – the highly addictive Move It! If you think you’ve already played the best block puzzle games on your smartphone, wait until you’ve played Move It! Colorful game environments, tons of game levels to conquer and of course challenging puzzles characterize just how good this game is. 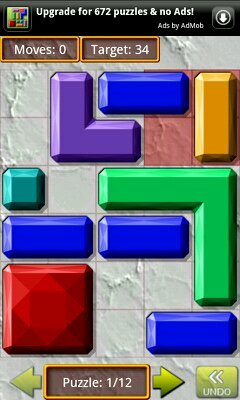 Move It Android game is not like your other block puzzle game where you are allowed to move blocks only in one direction. This game lets you move blocks in all directions to move a red block into a specific spot on the game’s playing field. The thing is, there are many other blocks in different shapes blocking this red block. 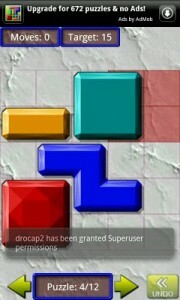 So, the game will challenge your wit to move these blocks out of the way to get the red block into the designated spot. The challenge? To move it in as fewer movement as possible. Everytime you move the red block on one grid equals to one movement. 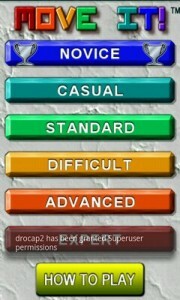 Every level has a benchmark which you can try to meet in finishing one level after another. The less movement you make, the higher your scores will be. Move It Android game is available as a free, ad-supported lite version which gives you 72 puzzles with 12 puzzles in every difficulty levels starting from Novice to Expert. You are also given several options to tweak the game environment including – background color, silent mode, animated screen transitions and an option to hide or unhide the status bar. On the main screen, you can also select the Tutorial mode. There is also a paid version which will cost you around USD$3 but wil give you 672 puzzles all in all. Overall, the game may seem simple at first and may look like just another one of your puzzle game for Android. Actually it is a simple game with a simple gameplay – but a very challenging one. If you’re into puzzle games especially those types which entail moving blocks, this game is a different spin – a very entertaining, challenging and fun spin-off if I may say so.